My last tournament at St Francis Links was an interesting one. I always love playing at the Links, but after putting together two decent rounds, things went a bit pear-shaped in the final round and I signed for a 78. It was just a horrible round and I don’t really have an explanation for it. I had some bad lack and a few bad swings, but what really hurt my score was how I compounded my mistakes. I guess that’s what happens when you are quite an aggressive player, but it’s all part of a learning curve and something I need to be mindful of when I head off to Europe for Qualifying School in a few weeks’ time. I really need to limit my double-bogeys and I’ve been working hard on my wedge game. I’ve even been trying some new shots with Q-School in mind – trying a few lower shots that might come in handy. After seeing the weather forecast at St Francis, the Sunshine Tour made a very smart decision to play two rounds on the first day – and it’s a good thing they did because the second day was blowing a gale, and wet too. There was no chance balls would have stayed on the greens. I can’t remember the last time I played 36 in a day – and boy was I exhausted at the end of the day. I think I was in bed by 7pm. It was also a good reminder that I need to start doing some fitness, so I’ve decided to start jogging. I’ve bought myself some new running kit and I’m keen to get this body of mine back into showroom condition – watch this space! On the plus side, having a day off gave us the chance to watch some of the Ryder Cup, which was awesome. We sat and watched at St Francis Bay Golf Club, and after a morning of watching the Europeans dominate there was even a temptation to go out and play. Luckily, sense prevailed and we stayed indoors. We are in the middle of a three-week break between tournaments and I must admit it can be quite frustrating, because all I want to do is play. Obviously I spend a lot of my time practising, but I also enjoy catching up with friends and playing some PlayStation – I’ve just got the new Fifa 19 game and I’m already addicted. Next up for me is the Vodacom Origins in Parys next week. It’s weird because I’m defending champion, even though it is being played at a different course. 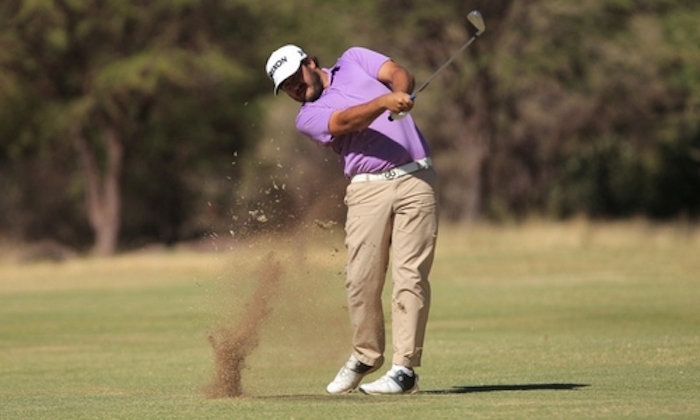 I won my first Sunshine Tour title at Sishen last year and this year they are playing at Parys. Still, I can’t wait to defend my title – I know there will be good vibes and I really enjoy the Parys course. I’m hoping to make it two years in a row!